What Are Tennis Betting Predictions Services? They all work similarly, although there are many different types. Basically they'll offer predictions or tips for how a match or tournament will end up, and for the way that individual games will progress - for example the number of games per set etc. Second only to soccer (outside the US anyway), tennis is widely popular... And any popular sport attracts a huge following. So it'll be no surprise to see that the big sports news sites cover tennis events. Each one at some point or other will write articles around up and coming matches - expressing views on how the match will unfold. You'll find tennis tipster type services all over the internet, in both standard online websites and increasingly in social media channels. They'll either be independent affiliate type sites which attract visitors by writing up matches and tournaments and offering tips, or similar types on Facebook or Twitter. Another type of tipster site that may be worth following are ones that publish the predictions of a number of different tipsters in tipping competitions. It often pays to keep a lookout for a strong tipster in these - almost certainly they'll be moving on to providing paid services if they're consistently accurate. You could argue that bookies have a vested interest in seeing you get it wrong, but many do offer sections on their websites that offer tips and predictions. Quite often these will be well thought out and well presented. After all, the bookies will anyway, it doesn't really matter to them if they make good recommendations as there will always be punters holding the opposing view. Betfair have a predictions and news section that covers reviews of various sporting events, including football matches. This is where we get to focus of this page - the algorithm-based prediction sites. For tennis, these offer the best chances for long term success with your betting. The prediction site we're going to focus on is Top Tennis Tips. Finding a good tennis betting forum can be a good way to find strong tipsters. When you do, it's best to make hay while the sun shines because eventually they're likely to progress to selling their predictions. Not always though, and finding a good forum-based tipster that wants to share predictions to help other punters out (or to prove they're that they can beat the bookies) can be like finding a small store of gold dust. This Covers forum offers some useful tennis betting threads, while the tennis section of Sportsbettingreview.com also has a number of recently posted predictions and tips. There's a whole lot to like about tennis betting prediction services, and not so many obvious drawbacks to using a good one. On the plus side they generally are based on analysis of a significant number of matches, meaning there is a huge database which should give accurate ideas of likely results. Add to this the fact that tennis is a one on one sport with only two possible outcomes in a head to head and you have the ideal situation for sports betting profits. They're also a huge time saver, with everything laid out for you and no need to carry out your own form and history studies. The down side is they'll cost you, and you'll need to make enough profit to cover the subscription fees at least. In tennis you'll often find prohibitive odds on a lot of matches where the result seems obvious beforehand. Always remember that even heavy favourites get beat now and then. In summary, if you want a better way to get an edge, you might want to consider football betting predictions. But if you're a tennis fan, there's a lot to be said for getting extra help to make successful betting selections. How Easy Is It To Win Money Online? Tennis is a great sport to focus on if you're looking to make money from sports betting, rivaled only by football betting in popularity. There are a wide range of betting markets for tennis matches, with plenty of ways to make profitable bets. If you're clued up on tennis players, surfaces, and the various tournaments then you'll probably have your own ways of identifying those great bets. But if you're not, then you'll benefit from using a tennis betting prediction service. 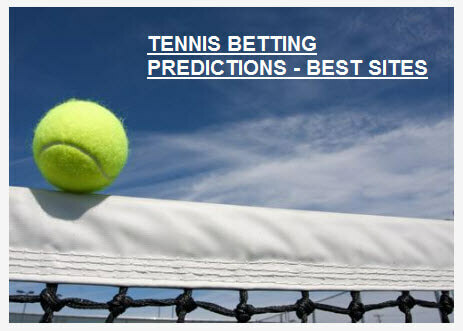 The good news for tennis fans is that there are a number to choose from, so on this page we'll be looking at which predictions services look to offer the best chances of positive results. So how does TopTennisTips.com work? Like many other predictions services, the Toptennistips algorithm is based on a collection and analysis of a significant volume of historic matches. In this case, 400000 in fact. They've taken into account a wide range of match statistics ranging from court surface to head to head and much more. The stats have been fed in to a machine learning tool to develop a model that shows how any given player will match up against another. Data on up and coming matches is then fed in to identify possible outcomes, with the result being a prediction of the way any future match should go. If you're on a paid subscription you can take these predictions and place your bets, with the actual predictions getting updated every 2 hours. But you don't have to accept the base data that comes out. You can create and test strategies that best suit what you want to get out. For example if you're looking for a specific percentage profit you can run what's known as a backtest to see how you would have performed. Past performance of course is always a good indicator of what might happen in future. At any one point you'll find around 200 tips on matches in the system, with a total of close on 25000 matches predicted in the first half of the year. This is going to be one to find out yourself, but the website boasts a success rate of up to 90% and a profit yield of around 30%. First off, you can try it for free with a free trial week. Check out the full membership levels here.